Of all the problems facing the book industry there is one area that isn't discussed very often. Shipping/freight has become a competitive edge and contest. I'm certain it's dealt with frequently behind closed office doors at publishers and distributors but I've never had a conversation with other booksellers about shipping. Within the past decade it's become a necessity for large publishers to offer free freight on orders and, in some cases, returns. Off the top of our collective heads here at Micawber's we couldn't think of one major publisher that charges freight on orders. Of course that causes problems for smaller publishers who cannot offer the same. It might less direct orders. It might mean none at all from certain stores who only order from suppliers offering no shipping charges. It's enticing, no doubt about it. Yet someone pays those bills. And they must be gargantuan. Like everything in every business the ground is constantly shifting. Promotions and offers come and go. Trucking companies undercut one another. FedEx and UPS do battle daily and other places try to get in the game(like DHL). I probably see 50-75 UPS and FedEx trucks go down Como Ave. every day. As our world has gotten 'smaller' and we ship more things than ever before this business has expanded tenfold. 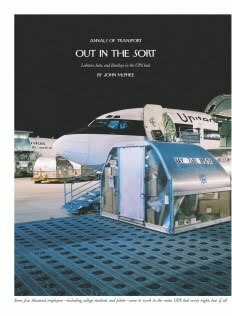 John McPhee has a great piece about the inner workings of shipping complexes. There are so many factors that are in the mix. We periodically get notices about fees due to gas prices. Everything fluctuates. This morning I opened a single box from a prominent University Press. It contained one copy of a book that is listed at $19.95 Our total is $10.97 and the shipping charge was $8.60(which was waived for us). It's pretty clear to see how an awful lot of money can be lost. There are other examples where we do pay that freight and then opposite is true: even if we sell the book the result is that we've made one dollar--not taking into consideration any fees we might pay for it being bought via credit/debit card. I'm not exactly sure what I'm trying to say. It isn't a problem with any one company or person. It's a matter that affects all of us in fairly significant ways. A company called Home Direct USA provides home direct shipping and has risen among it's competitors. They have brought a valuable service to both consumers and retailers. I personally have never used them, but my friends have told me that it was some of the best shipping service they ever received. I guess this is a good company to know once this holiday season hits us.